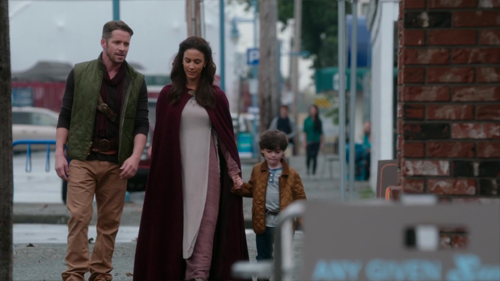 We start with the family Hood – Robin, Marian, and Roland – bopping around Storybrooke. I have no idea how much time has gone by but Marian is still wearing her Enchanted Forest outfit and the boys are showing her around town. Roland likes Storybrooke because ice cream (smart kid) and gets his way because he’s already figured out how to play the Stepmom card. The ice cream lady we in the audience know to be Another Snow Queen brings out two rocky roads for Robin and Roland and then makes an extra special vanilla with sprinkles for Marian. Extra special cuz it’s cursed (dun dun dun). Meanwhile in Gold’s shop Rumple tells Elsa, Emma, Hook, and Belle that he certainly definitely absolutely never saw Elsa before but nobody except Belle believes him because he is a lying liar who lies. And also they’ve watched this show and know that he is in everybody’s business all the time. 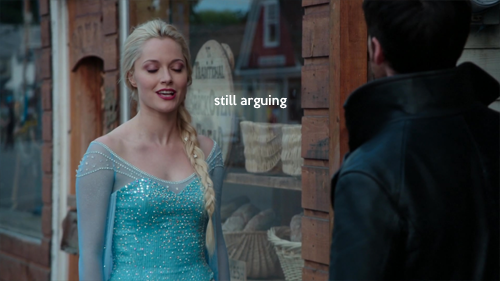 There is zero point zero zero zero chance that Rumple does not know Elsa! Emma: She came out of your urn! 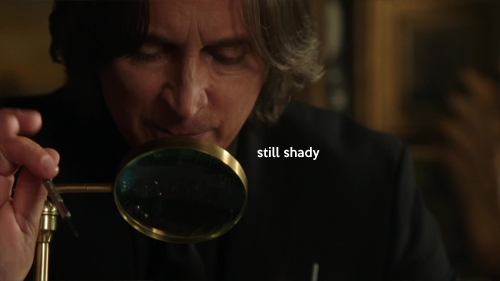 Rumple: Nothing in my shop is MINE. Emma: So you are a thief as well as a lying liar who lies? 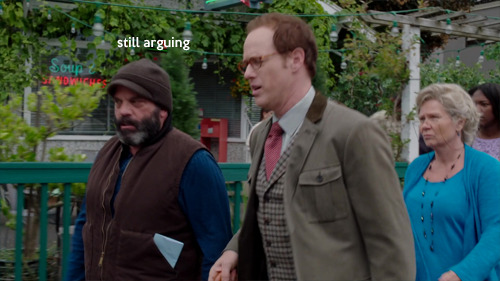 Rumple: In the past, but now that the son I spent approximately 400 years manipulating basically everyone and everything to save is irrevocably dead I’ve decided to turn over a new leaf. And here’s the proof, my pretty wife who I am totally not lying to about, idk, everything. Belle: Yeah! So we don’t have to listen to your baseless accusations! Hook: I don’t think you know what that word means. 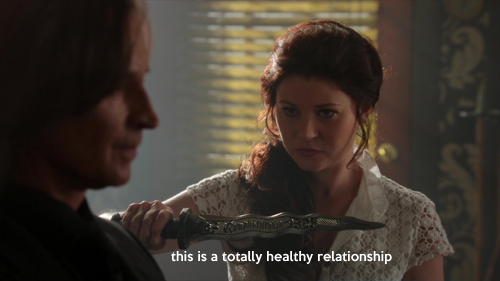 Rumple: I’ll prove it to by having Belle force me to tell the truth with my dagger. Belle balks but agrees if it’s the only way they’ll believe him. And they do even though every single time Rumple has volunteered anything it has been in his own best interest and pretty much no one else’s. Learning from past mistakes is not anyone’s strong point on this show. 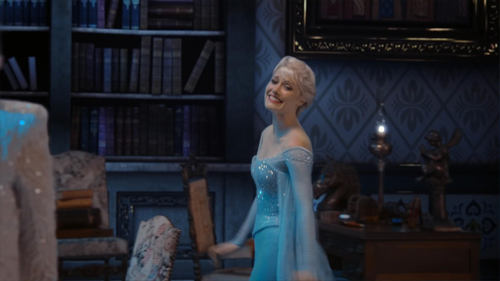 We flash back to Arendelle of the past where Elsa has a new hairstyle and is on a tear about Anna being missing. 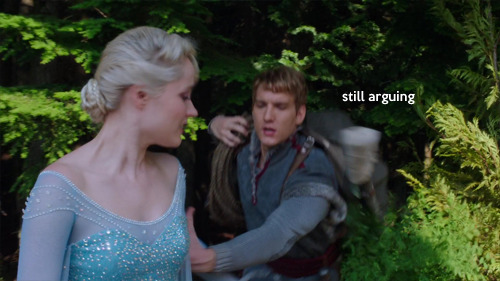 Is anyone else bothered that Kristoff and Anna have had zero screentime together? It’s hard to hang on to their love story. 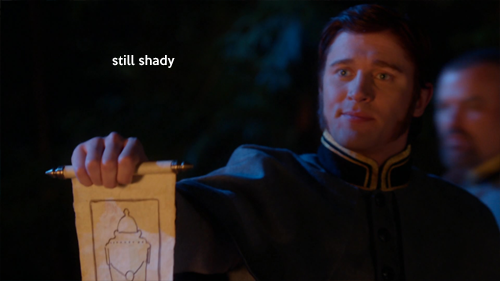 Anyway, Kristoff is the Snow White of this realm cuz he thinks everything is fine and if not he’ll just go off into the wilderness and fix it. Elsa says no. Guess what happens. 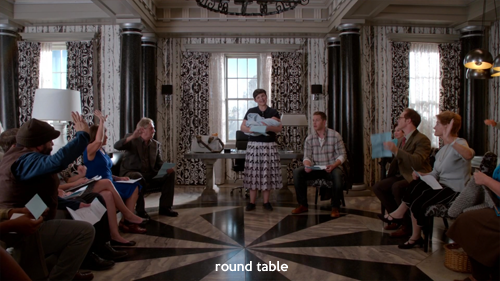 Forward in Storybrooke Mama Mayor is having a council meeting at her office and it goes just as well as it always does. Grumpy: Fix all my problems immediately! Granny: Fix all my problems immediately! 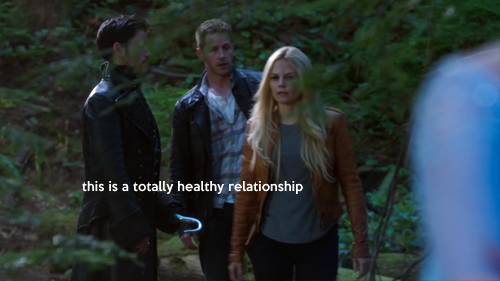 Charming: Everyone settle down and listen. Snow: That won’t undermine my authority in the slightest. And then Marian falls over. 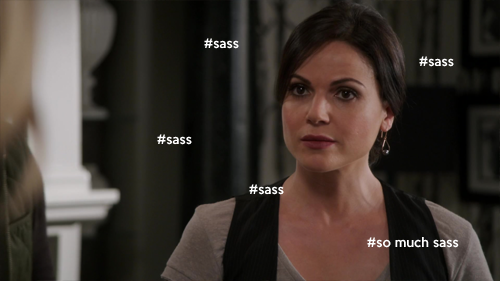 At approximately exactly the same time Regina and Henry are chilling at Granny’s. Regina: Isn’t it weird how these comic books are just stories but your magic storybook is totally real? Henry: I know you’re up to something what is it? Regina: I want to find the author of your book and convince him to give me a happy ending. Is that crazy? Henry: Yes, but also awesome, when do we begin? Emma: Get away from me! 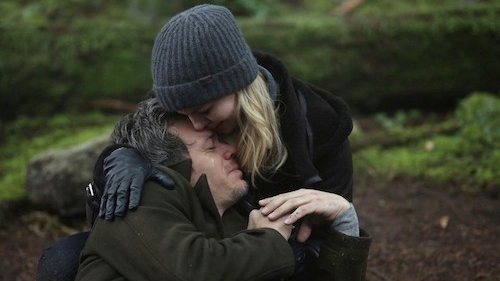 So, Hook and Elsa head off to hide and Emma and Charming head off to find Another Snow Queen. Elsa: I refuse to hide! 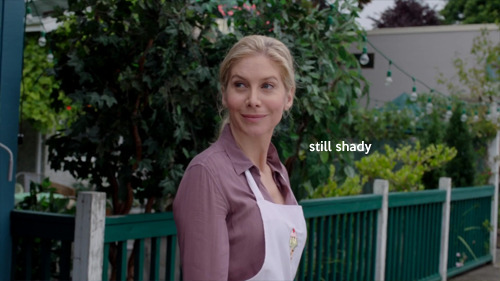 Hook: Lol, you thought I was respecting Emma’s authority and/or wishes? Silly girl. We’re going to crash on into the action and screw things up like always. Me: That is not hot!!!!!!!! 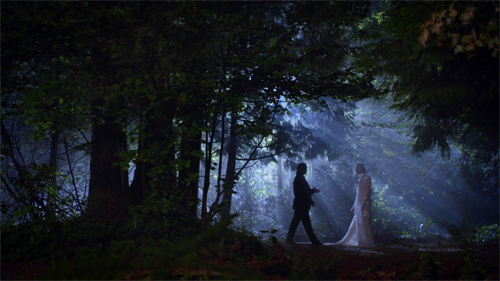 Emma and Charming are searching the woods. 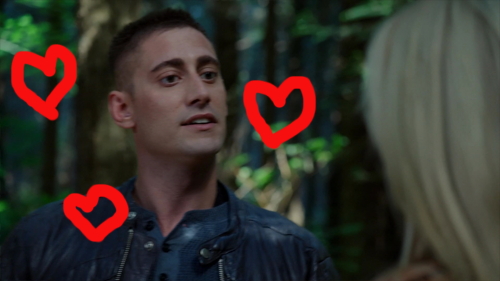 I love Will Scarlet. 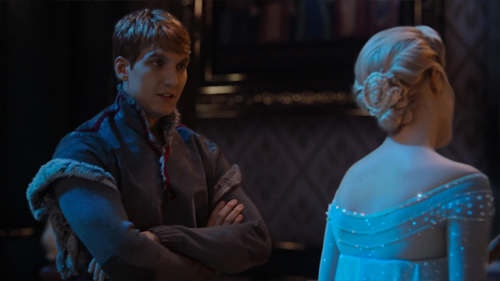 And he has intel about Another Snow Queen. Convenient! Hook’s somewhat hilarious plan is to blackmail Rumple into helping them find Another Snow Queen while Elsa window shops in his store. Hook: I know you are a lying liar who lies. Hook: And I’m gonna tell everyone. Rumple: And they will believe you why? 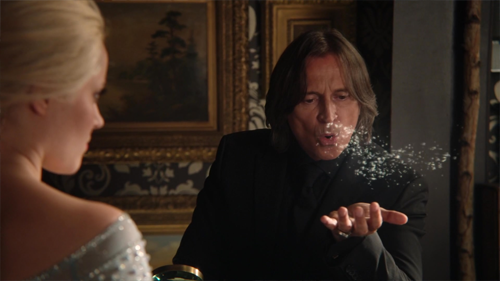 They conveniently have a lock of Another Snow Queen’s hair and Rumple magics it into snow and sets it free to lead them to her or her lair or something. Archie ambushes Mary Margaret in the parking lot to advise her to get a nanny. Meanwhile Emma and Charming are searching the ice cream shop. The snow leads Hook and Elsa to the woods and Elsa wishes she remembered what she forgot which is that she and Kristoff found the urn in a cave before Hans and his brothers did and they set Another Snow Queen free and she was totally nice in that way you know means she is totally evil. 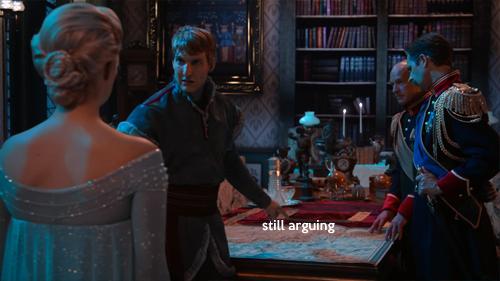 Another Snow Queen interrupts the flashback to taunt Elsa with her knowledge of …the flashback and claims that Anna locked her up in the urn which Elsa refuses to believe and I agree. 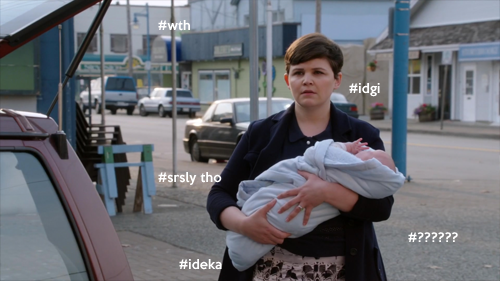 Another Snow Queen welcomes Emma by name which Emma finds super shady and I agree. 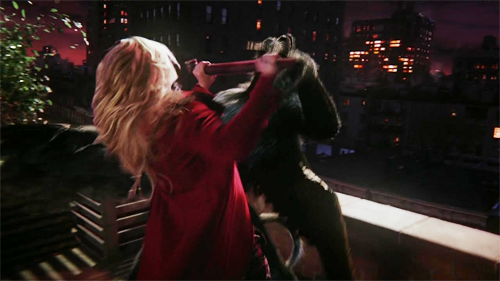 Emma: I told you to stay away! Emma: I told you no! We flash back to Arendelle for Another Snow Queen’s revelation that she is Elsa’s mother’s sister so we can all assume that Elsa’s mother put ASQ in the urn. In the present Marian is almost completely frozen. 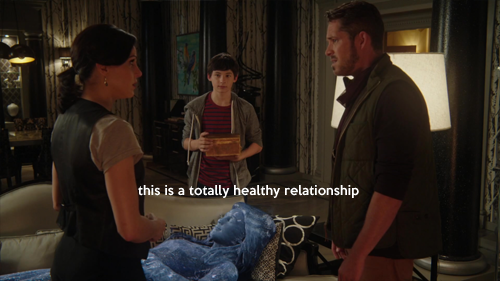 Robin: I know why True Love’s Kiss didn’t work. Regina: I can’t decide if I want to hear this. Robin: I’m in love with someone else. Robin: Really. I just wish I wasn’t still married to my un-dead-sort-of-dead-again wife. Robin: I have a code! Regina: I did not want to hear this. Regina saves Marian’s life (again) by taking her heart so her body is in stasis or something. Across town Hook and Emma start to have their same conversation but then something amazing happens. They actually communicate. Hook: I am going to stand by you no matter what because I love you. Emma: That’s why you have to stay away! Emma: Because everyone I’ve ever been with is dead! Hook: I’m a survivor, love. And they kiss and I don’t even roll my eyes because Emma finally finally said what I have been expecting and hoping and wanting and needing her to say for at least two seasons. Everyone I love dies. 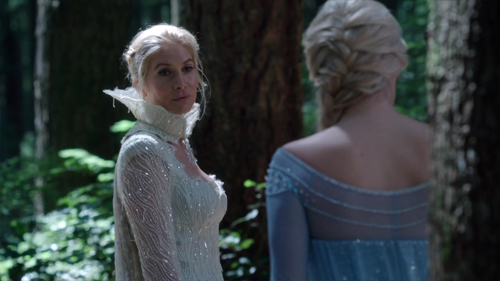 Anyway, finally Another Snow Queen and Rumple the Lying Liar Who Lies meet up in the woods to be shady, creepy bffs and lbr they’re probably related, too. Next week: Another Snow Queen has a chariot just like the White Witch in Narnia!